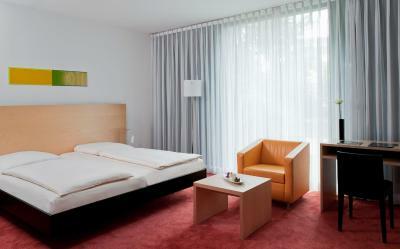 Lock in a great price for Innside by Meliá Düsseldorf Seestern – rated 8.1 by recent guests! Modern, free parking near the hotel (during weekend). Rooms are facing the garden. Close to city center. The View and the structure and layout of the Hotel is amazing. Nice hotel. Convenient for the office I was visiting. Very good fitness center. Modern facilities. Friendly staff and forthcoming upon requests. My luggage had been lost at the airport upon my arrival and I was very upset by the time I reached the hotel, the staff were absolutely adorable and quickly rallied around to get me some essentials include a clean t-shirt so I could get out of my sweaty clothes. Room with two separite beds was not what I expected. 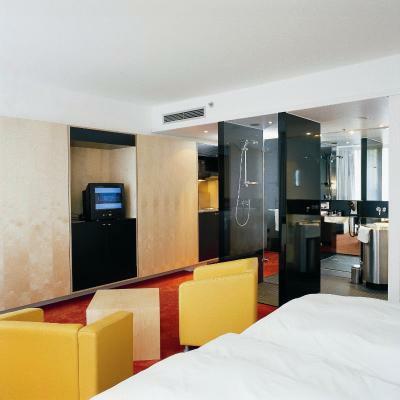 Innside by Meliá Düsseldorf Seestern This rating is a reflection of how the property compares to the industry standard when it comes to price, facilities and services available. It's based on a self-evaluation by the property. Use this rating to help choose your stay! 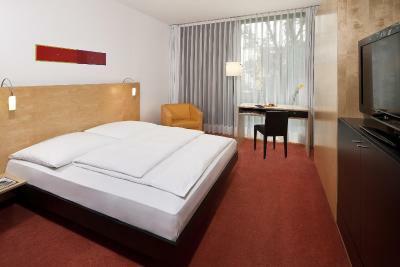 One of our top picks in Düsseldorf.Featuring elegant rooms, this modern hotel provides easy access to the trade fair, Düsseldorf Airport and the Old Town District. Am Seestern Underground Station is just a minute’s walk away. 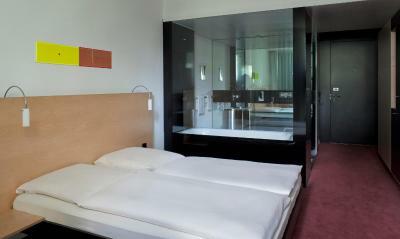 The Innside by Meliá Düsseldorf Seestern offers bright, open-plan rooms with transparent bathing area and queen-size beds. 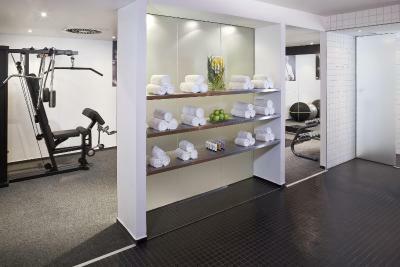 Relax and get in shape at the hotel's wellness area with a sauna, infrared cabin and modern fitness equipment. Massages can be booked. An underground station is just a one-minute walk from the Innside by Meliá Düsseldorf Seestern, allowing you to travel throughout the city with ease. 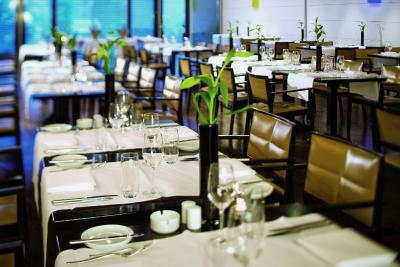 After a long day’s sightseeing or business activities, enjoy exciting cuisine at the hotel’s DADO restaurant and bar. Lörick is a great choice for travelers interested in old-town exploration, city trips and beer. 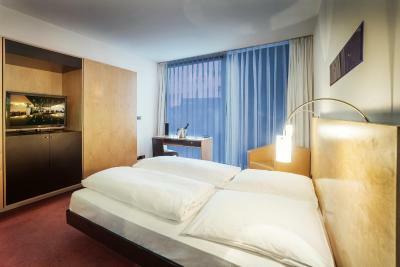 When would you like to stay at Innside by Meliá Düsseldorf Seestern? 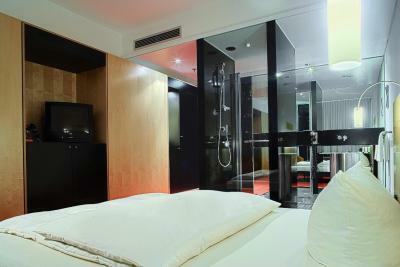 Including free mini-bar drinks, free Sky satellite channels and free WiFi. There is a kitchenette with a microwave and a walk-in cupboard. 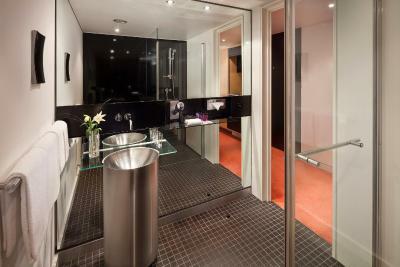 Including free mini-bar drinks, free Sky satellite channels and free WiFi. Restrained elegance and pure design welcome you. 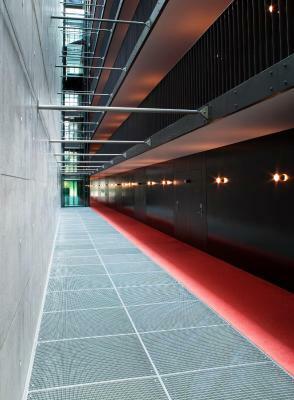 The special accent of the hotel is the exposed concrete wall with embedded glass rods, which connects the hotel building with the hotel rooms tract. Clear lines and shapes, precious materials and an extraordinary interior characterize the design of the 126 rooms. 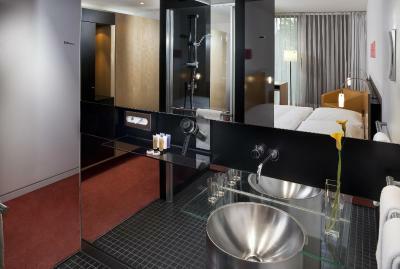 The bathroom in glossy black and stainless steel underline the extravagant atmosphere. 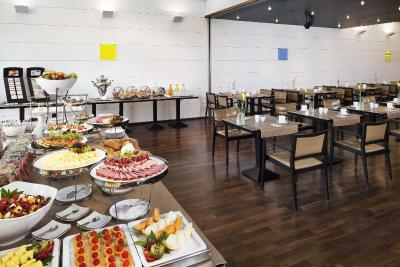 The restaurant DADO offers throughout the day a high-quality gastronomic offer and a central meeting place for lunch, dinner and the cappuccino in between. The team presents fine wines and a large variety of beverages at the bar. 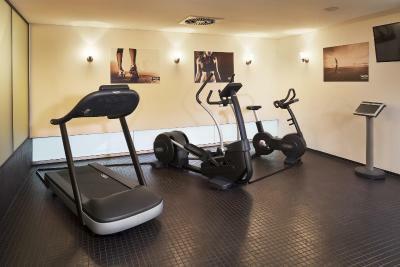 Enjoy the wellness center with sauna, infrared cabin, relaxing area and fitness facilities. 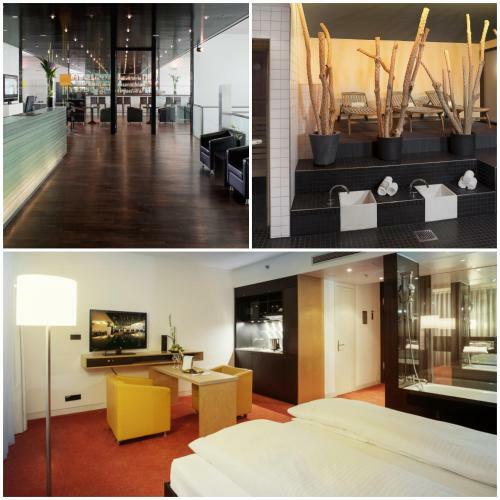 House Rules Innside by Meliá Düsseldorf Seestern takes special requests – add in the next step! 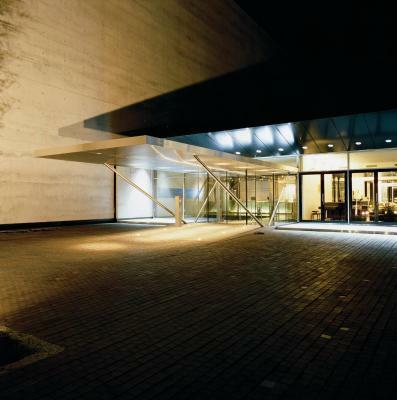 Innside by Meliá Düsseldorf Seestern accepts these cards and reserves the right to temporarily hold an amount prior to arrival. Please note, private parking is available at in the underground car park. No additional lock on the room door and door opened when in the room. Breakfast only has one price - can be expensive if just having fruit vs cooked breakfast. Friendly staff. Nice furnishing and clean. Free mini bar was a great surprise! We were lucky with the heating / air conditioning in our room as everything worked perfectly fine. However our friends room and other guests room had issues with heating up. Having the shower in the middle of the room left a dirty smell of sewage all throughout as it seems they do not clean the shower drainage daily. This is not the first time incident. Furthermore the check in experience was not the best. The receptionist had very limited communication with no friendliness. The room was very good. High-design rooms with tasteful decorations - interesting bathroom configuration with «open» shower that has glass facing the bedroom (and window). Very good restaurant on-site and a nice bar area with an «after work» party with a DJ ad tastefully muted but interesting music. The check in took 15 min. Were lacking staff many people werde waiting and only one staff for ätzend the guest. The Wellness area was a Disaster water every where and used towels on the floor. No fresh towels . Finally I went upstairs to the reception and called a staff to come and attend . Very nice staff and polite, it was pleasant stay for 2 weeks. Very nice kitchen provided.